Dive into an exceptional world designed on Irish Folklore. 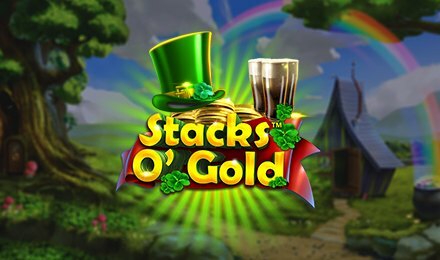 Packed with 5 reels and 34 paylines, Stacks O’ Gold slot comes packed with a number of bonus rounds and features in the game. Now, all you have to do is start the game on either your mobile, desktop or tablet and enjoy! While you enjoy the greeneries and rainbows that fall in the background of the slot grid, you will find symbols like; horse shoes, pints of stout, top hats, gold coins, bronze coins and silver coins landing on your reels. The highest paying symbol is the golden four-leaf clover, that awards 10x your stake for a five-symbol combination. Set your stakes on the Bet Field, then click on the Spin button to get the game started. All you need to do is land winning combinations of three, four or five symbols on active paylines. Amount of Paylines Selection: All 34 paylines remain fixed. Coin Values: Coin values are set from £0.20 to £20.00. The wild symbol of the game is the Pot of Gold. This replaces for all symbols on the reels, except for the scatter symbol. Six Wilds : 2 extra free spins, the first reel turns sticky. 10 Wilds : 2 extra free spins, three reels turn sticky. Collecting an additional ten wilds on reels 2, 4 and 5 will turn the 5th reel sticky and one extra spins will be awarded. Golden wilds make a special appearance, where odd reels are turned into wilds for the free spins that follows.